With Cruz first out of the gate among Republican contenders and a long line of competitors ready to follow, will Liberty be the venue for their announcements as well? Will Rev. Jerry Falwell Jr., who has run the institution in place of his father who died in 2007, offer the mic to Hillary Clinton, Martin O’Malley, or Joe Biden should these Democratic apostates want to make their announcements there? Wouldn’t you just love to see Biden’s happy face in that setting? 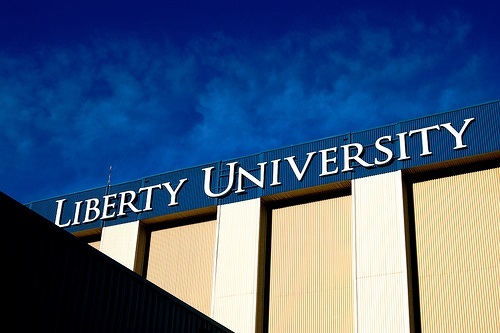 Liberty officials have argued, as the NPQ Newswire reported, that Cruz spoke at a thrice-weekly convocation that is mandatory for all students, no matter who happens to be speaking. In fact, they said that the speaker who originally had been scheduled was Virginia Governor Terry McAuliffe, a Democrat, who withdrew in favor of some other time. However, knowing that Cruz was announcing, Liberty could have chosen a time and place at which students would not have faced fines had they chosen to skip the event and avoid having to wave the little American flags distributed by the Cruz campaign. Liberty knew what Cruz wanted and gave him the venue for maximum political effect. If past is precedent, Koskinen is unlikely to act, or if he does, it will be when there is a new occupant in the White House after the 2016 elections. Partisan “politicking” on the part of churches and faith-based nonprofits like Liberty has become quite commonplace, to the detriment of the important nonpartisan, nonpolitical identity of the nonprofit sector. The NPQ Newswire texted that number on March 26th and got this as its automatic response: “Thanks for opting in to get updates. More info visit tedcruz.org.” The website, tedcruz.org, is the Cruz for President website.